The symbol of Pegasus gives you inspiration, quick and agile wisdom and inspires your ability to fly over any situation. He can be a helper with spiritual explorations and a protector during your spiritual travels. He will help you work to change evil into good. 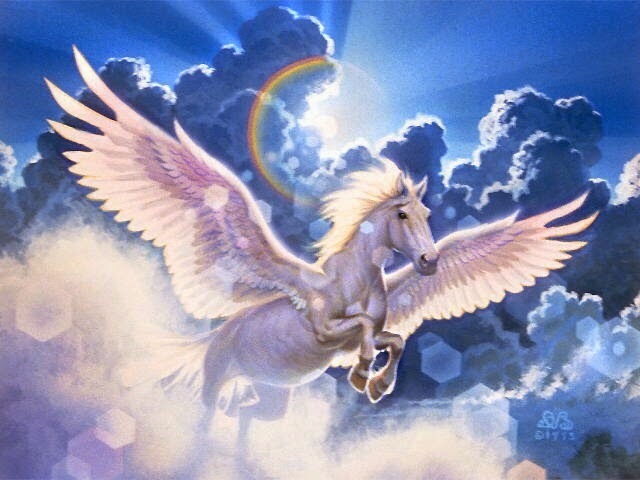 Pegasus, though gentle, is very strong and in Greek mythology carried of Zeus' thunderbolt. He is the horse of the Muses, in the service of poets and I hope you are privileged to ride on his back to find your inspiration!